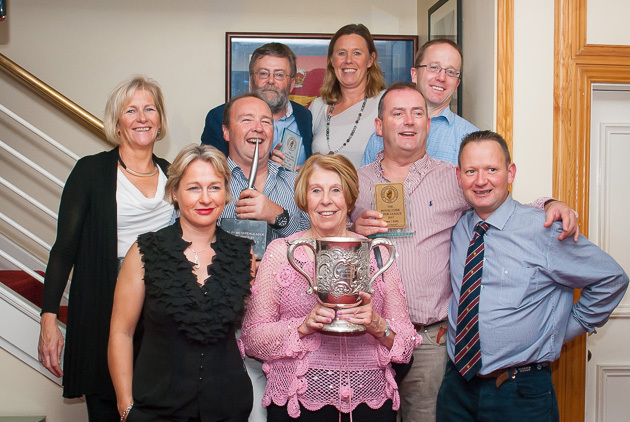 The crew of Tux with the Sans Souci Cup. Picture Robert Bateman. 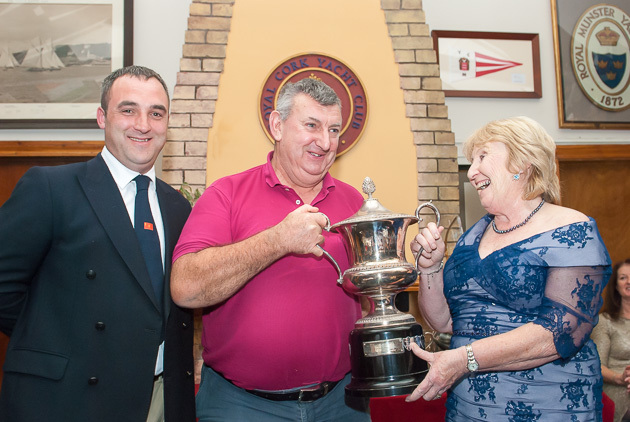 Saturday night saw the annual Super League prize giving dinner take place and a very enjoyable evening it was too.. Admiral Pat Lyons and the Lady Admiral, Ann, together with the ever hard working Rear Admiral Keelboats, Kieran O’Connell, entertained Sponsors and invited guests. 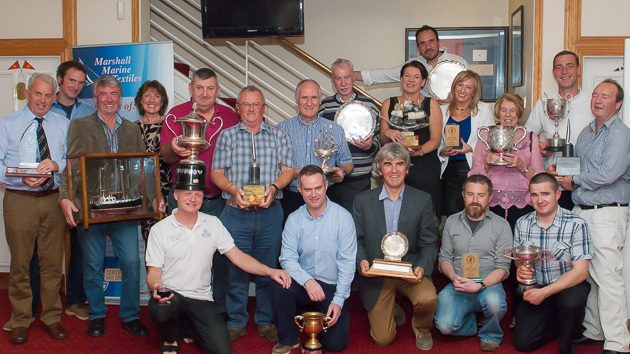 The events involved were the UK McWilliam May League, the North Sails Sunday Morning League, the Union Chandlery June League, the Coastal events, the Marshall Textiles July League, the Royal Cork September League and the September Naval Race. Also awarded on the night was a glittering array of magnificent perpetual trophies and these combined with the awarding of the Super League trophies kept the Lady Admiral very occupied for the evening as she graciously assisted the Rear Admiral Keelboats with the presentations to the sound of cheers, applause and camera phones by the dozen appearing to float through the air. 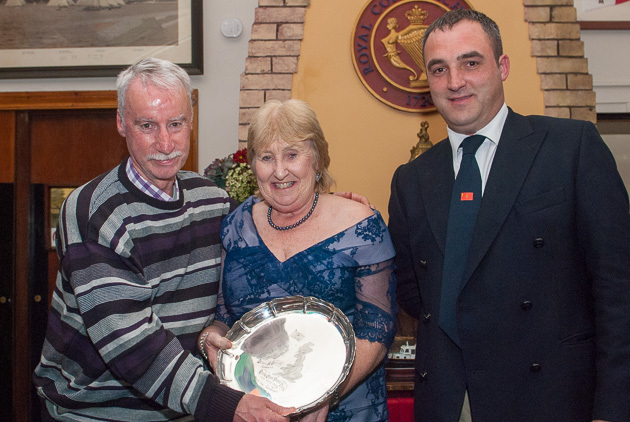 The much coveted Boat of the Year Award was presented to a surprised but delighted Conor Phelan and listed in his crew was Nigel Young. Nigel of North Sails, who was accompanied to the Super League Dinner, by his wife, Fiona, is a generous sponsor to the club and this season sponsored the Sunday Morning North Sails League. 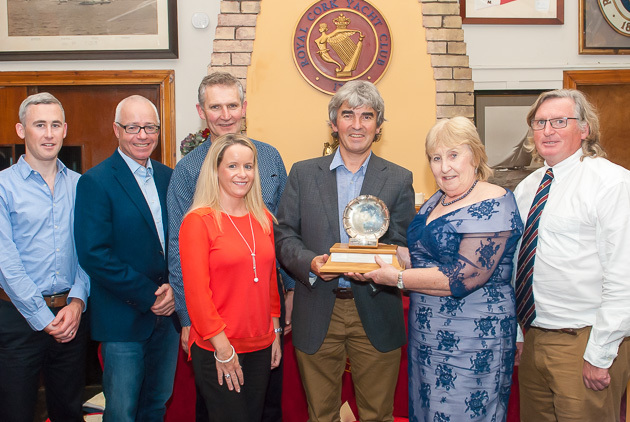 The Martin McDonnell Trophy for the Whitesail Boat of the Year was won by Tom MacSweeny’s Scribbler 2 and collected by John Murphy in Tom’s absence. 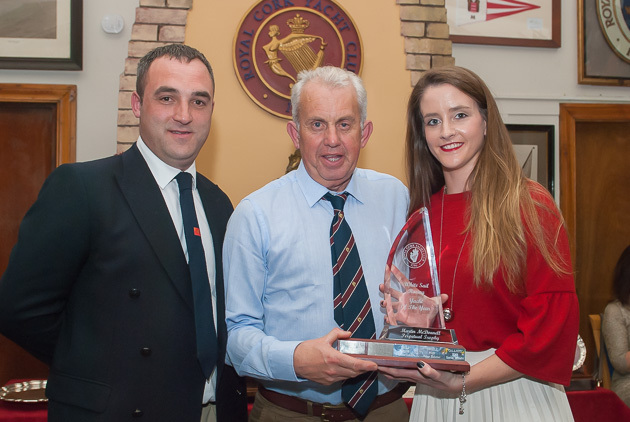 Julie Anne McDonnell presented the trophy in memory of her late father and her mother, Carol, was also present at the evening. 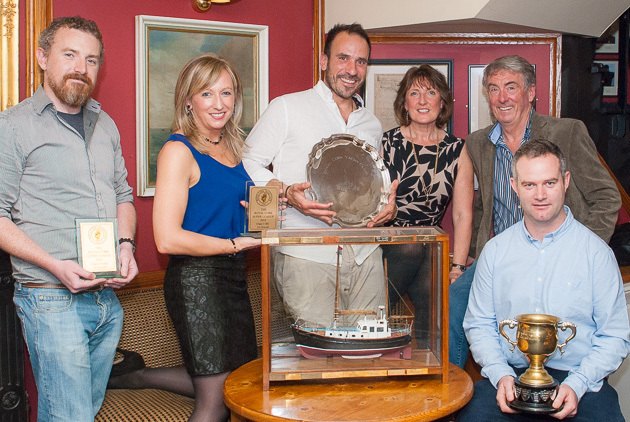 Rear Admiral Keelboats, Kieran O’Connell, John Murphy representing Scribbler 2 and Julie Anne McDonnell. Picture Robert Bateman. 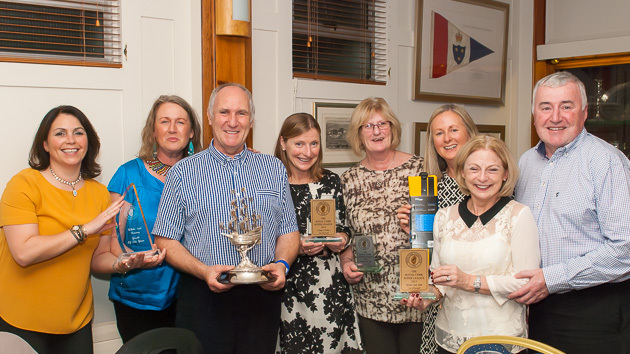 The Club Boat of the Year was hotly contested and came down a one point difference in favour of Clem and Wendy McElligot’s Sea Hawk over Leonard Donnery’s ‘No Gnomes’. 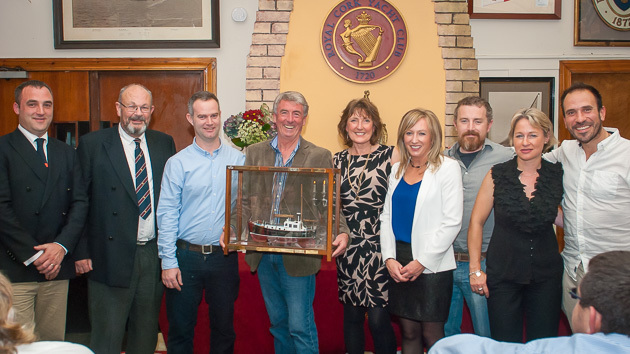 This battle was for the ‘Stack Polly’ trophy, that was a very well known boat in the Royal Cork Yacht Club and was presented on behalf of John McWilliam by his brother Des who spoke briefly on the history of the vessel. Other trophy winners were The Phelan Trophy for IRC went to True Pennance, The Phelan Trophy for ECHO went to Tux, the H. Harling Trophy went to Heroes and Villians, the Harold Cudmore Trophy went to Bad Company, the Clytie Cup went to Sea Hawk, the Atlantic Fleet Galleon went to Thistle, the H Howard Gould Trophy went to Cosmic, the First Sloop Flotilla went to Minx 111, the Sans Souci Trophy went to Tux, the Hugh Smith Barry trophy went to Alpaca, the Bayona Trophy went to YaGottaWanna, the Breffni McGovern trophy went to True Pennance, the Smelter Valley Trophy went to Jedi, the Muckley Trophy went to YaGottaWanna, The Admiral Doyle Plate went to Loch Greine and finally, the Jim Donegan Plate went to Sea Hawk. Thus ended the formal formal proceedings of the evening but your scribe is in no doubt the festivities continued well into the night. 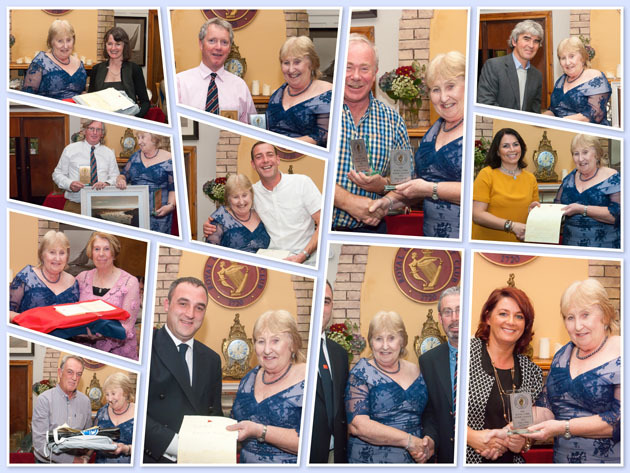 Another happy group of prizewinners . Picture Robert Bateman. 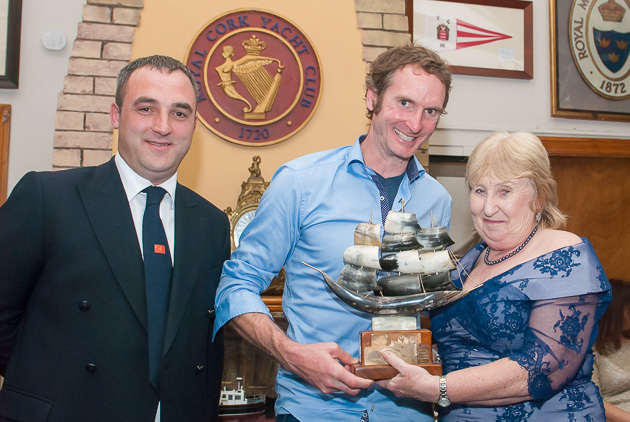 Dave Lane,YaGottaWanna, receiving the Bayona Trophy from the Lady Admiral watched by Rear Admiral Keelboats, Kieran O’Connell.